In 2016, Microsoft made headlines by boasting that Microsoft Edge was the only major browser to run Netflix in 1080p. As part of the Windows 10 Creators Update’s blitz of new features, Edge has now made the jump to 4K, and it’s the first major PC browser to do so. To test the feature, we fired up Netflix within Chrome, Opera, Firefox, and Edge. Edge—as well as the Windows 10 Netflix app that you can download from the Microsoft Store—appears to be the only way to run 4K Netflix content on your PC. Still, there’s a catch: Besides the fact that you’ll need either an external 4K monitor or native laptop display, your PC or laptop will need to have an Intel Kaby Lake CPU. Fortunately, we have such a laptop: the lovely HP Spectre x360 15, with a Core i7-7500U chip inside and a true 3840x2160 display. Using the diagnostic tools within Netflix, we can see that Edge is streaming in 4K. (Unfortunately, it seems that DRM or other technical limitations block screenshots, so we used a camera instead.) Click the picture to zoom in. When properly configured, Netflix will fill that display with some truly beautiful pixels. Just make sure you’ve upgraded your Netflix account to a plan capable of 4K, which costs $11.99 per month instead of the usual $8.99/mo. You’ll also need a high-speed data plan from your ISP—if you enlarge the graphics accompanying this story, you’ll see that Netflix was pushing a whopping 269Mbps of video data in our test. That’s about the limit of Comcast’s Extreme 250 internet plan, which costs around $70 per month in the San Francisco Bay Area. And if you choose not to run Edge? Well, then it’s back to a lowly 720p experience for you, sorry to say. 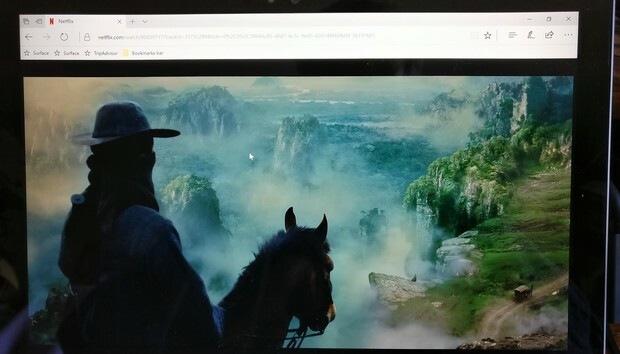 In our tests, using the hidden menu options within Netflix, I was able to confirm that Chrome, Opera, and Firefox all rendered Netflix, but only at a maximum resolution of 1280x720. Though Netflix is still feeding the browser 4K levels of throughput, Opera, Chrome, and Firefox are only able to output Netflix at 720p. Edge skeptics should note, however, that Microsoft’s browser has continued to improve. I’ve personally gone from being critical of Edge to now seeing it as a competent-to-good browser. (See more about my Edge assessment in our Windows 10 Creators Update review.) Fortunately, you don’t have to do a single thing to get Microsoft Edge—if you own Windows 10, you automatically own the browser. Why this matters: Microsoft has worked hard to convince users that Edge’s early performance problems were an anomaly. Microsoft Rewards will “pay” you for using Edge, Cortana’s baked right in to the browser, and Edge now supports e-reading EPUB books, too. Providing 4K Netflix support is just the latest way Microsoft hopes to convince you to switch browsers. Sure, Chrome, Firefox, and Opera have their own advantages. But these sorts of “exclusives” probably help Edge’s reputation the most.